Heatstroke in dogs can be caused by being in a hot car. 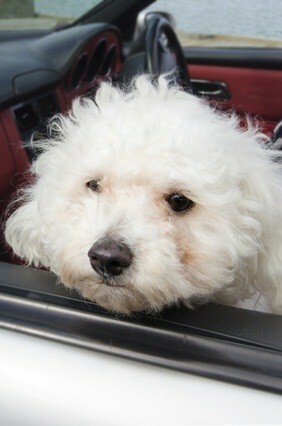 Never leave your poodle in a hot car, even with the windows down, when the outside temperature is hot and humid. When it's hot outside, your car gets extremely hot inside. If you think your car is really hot, so does your pet. It's best to leave them at home on any day where your car's temperature rises, and when you don't need to take them with you. If you must take them with you, take someone else along. Do your errands while leaving the car running (window slightly down) with the air on. Or roll the window down if it's not extremely hot out and have the other person stay in the car. It's not recommended to leave your car running with the air on and your pet alone inside. Nor is it recommended to turn your car off with the windows rolled up. Even cracked, a car in the sun with rising temperatures can turn into a sauna for your pet. For safety reasons, do not turn off your car and roll the windows down and leave your pet alone. She can get loose or be stolen. Signs of heatstroke in dogs, which need immediate attention include panting quickly, excess saliva dripping from her mouth, lethargy, vomiting, diarrhea, bright red gums and very high fever. Cool her down immediately by taking her to a cold room, pour cold water over her or wrap her in cold towels. Call your vet for further instructions. Holly loved playing in the snow. 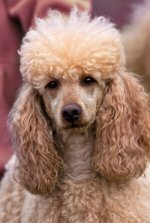 Poodles who spend too much time in the cold weather can get frostbite. Check the tips of her ears and the bottoms of her feet for pale skin patches. Dab warm (not hot) water on the affected area. Never use a hair dryer or heating pad or rub the area trying to warm it. Once warmed, put some petroleum jelly on the area. You can buy doggie boots to protect his feet in the cold weather or put petroleum jelly on the bottoms of his paws. 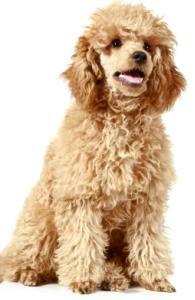 If your poodle gets burned, use ice on a small area, or wrap a cool towel around a larger area. If your pet is severely burned, it's an emergency - call your vet. If he gets a nosebleed, apply a cold compress to his nose and hold for a few minutes. Release and check to see if it's still bleeding. If it is, reapply the compress and repeat until the bleeding stops. Using common sense and staying calm can help prevent heatstroke in dogs, frostbite and burns in your poodle. If you think it is cold and hot outside, your pet feels the temperatures, too, so use good sense when taking your poodle in the car or leaving him outside for long periods of time.